Twelve people who took shelter from Hurricane Ioke on Johnston Island yesterday weathered the storm and are now headed back to Honolulu, the Coast Guard said. But a U.S. Fish and Wildlife Service biologist said some birds' chicks in the wildlife refuge might not have survived. Chief Petty Officer Marsha Delaney said the five crew members and seven contractors were apparently hired by the Air Force to do repair work on Johnston Island, one of four islands that make up Johnston Atoll. They were on a ship nearby Tuesday when the hurricane moved into the area. They took shelter in a bunker designed to withstand a hurricane. Yesterday afternoon, the Coast Guard flew a C-130 plane over the island and dropped radios. The antenna on the group's ship had come down during the storm, cutting off communication. Also on board the C-130 was Beth Flint, a supervisory wildlife biologist with the Pacific Remote Islands National Wildlife Refuge Complex. Flint said she was "pleasantly surprised" at how the island had come through the storm. "The few trees that are there were still standing, and we saw flocks of large birds flying around," Flint said. She said the water was clear, and from the air there did not appear to be much damage to the coral reefs. But Flint said young chicks like the Bulwer's petrel burrow in low-lying areas during this time of year, and she suspects many might have drowned. "While they may have lost their chicks, I suspect the adults survived and will try again next year," Flint said. A videotape she made during the flight will be reviewed by other experts to help determine the extent of the damage. The atoll has been used by the U.S. military for weapons tests and as the site of a chemical weapons disposal plant. Robert Ballard, a hurricane forecaster with the National Weather Service in Honolulu, said Hurricane Ioke had winds of 105 mph, with gusts of up to 125 mph, when it hit Johnston Atoll. 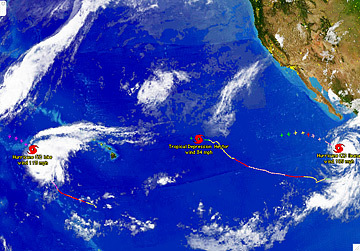 The Category 2 storm was about 920 miles west of Honolulu yesterday afternoon. Meanwhile, a tropical disturbance formed about 510 miles southeast of Hilo. The weather system is not expected to intensify into a hurricane, but could bring some showers this weekend to the state, Ballard said. The remnants of Tropical Storm Hector moved into the Central Pacific yesterday and were expected to bring some surf to east shores through Saturday.